By the late eighteenth century, the British East India Company had consolidated their power in Bengal and was operating as a proxy government for the British Crown. Revenue from the Indian land gave a boost to the British economy Which had a GDP of just less than 1% when the company arrived in India. In the early colonial period, European missionaries made a beeline to India for the purpose of converting the natives to Christianity and were not averse to making money on the sideline. Into this milieu that saw corruption and cheating by the English government at its peak arrived James Augustus Hicky, an Irishman. He established a newspaper called the Bengal Gazette, which brought to light the dark side of the early British empire which squeezed the natives and made tons of money at their expense. 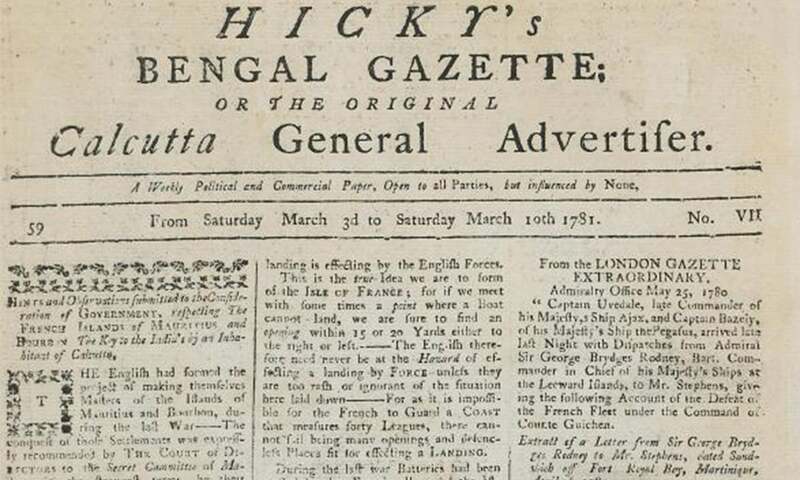 Hicky's Bengal Gazette or the Original Calcutta General Advertiser, an English language weekly newspaper published in Kolkata (formerly Calcutta), the capital of British India has the unique distinction of being the first newspaper printed in Asia. Journalism was in its infancy in Asia, no newspaper was published before this period for public readership. Tthough founded as India’s first newspaper, it was mostly written for Europeans, as they were most of this newspaper's subscribers and advertisers. The idea of newspaper was first mooted 12 years earlier by a Dutch man William Bolts, an adventurer, but it never happened. 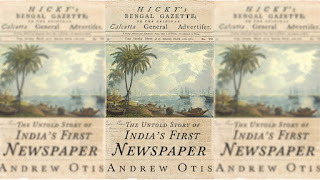 Hicky's newspaper was popular among the British soldiers and elite Indians. On January 29, 1780, one James Augustus Hicky founded the newspaper and made an assurance that “nothing will be inserted, unauthenticated” and that his newspaper would have a “rigid adherence to truth and facts”. The founder, an Irish man, it is believed, was highly eccentric and was behind the bar for two years; reason: unpaid debt. It was published on every Saturday and the price was just Re,1.00. Total readership was around 400 plus. Initially, Hicky wanted to maintain a neutral editing policy (his slogan being "Open to all Parties, but Influenced by None"). 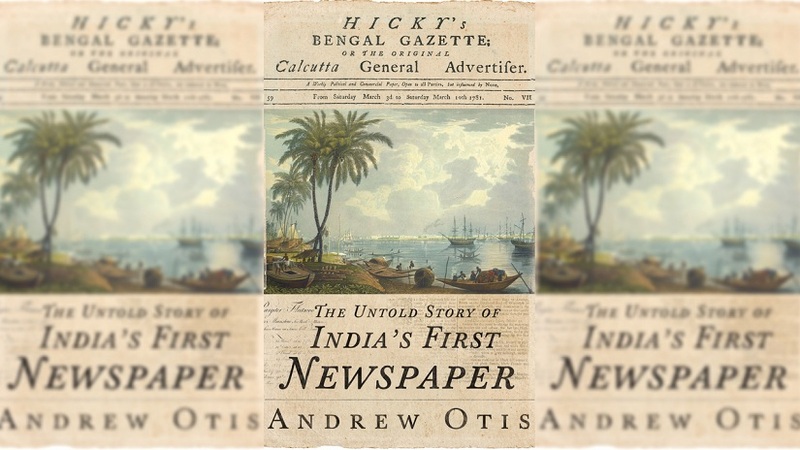 When a rival news paper The India Gazette backed by the East India Company was launched, Hicky had a row with some officials, in particular, Simon Droz and he also dragged Mrs. Hastings' name. In retaliation, the EIC refused to mail his newspapers though the post-office. 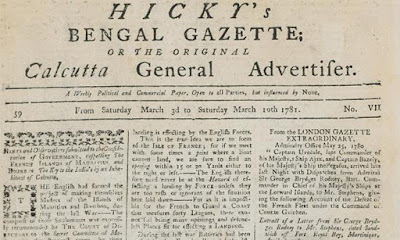 On November 18, 1780, the same day that the first India Gazette was published, undaunted as he was, Hicky changed the name of his newspaper now called Hicky's Bengal Gazette. 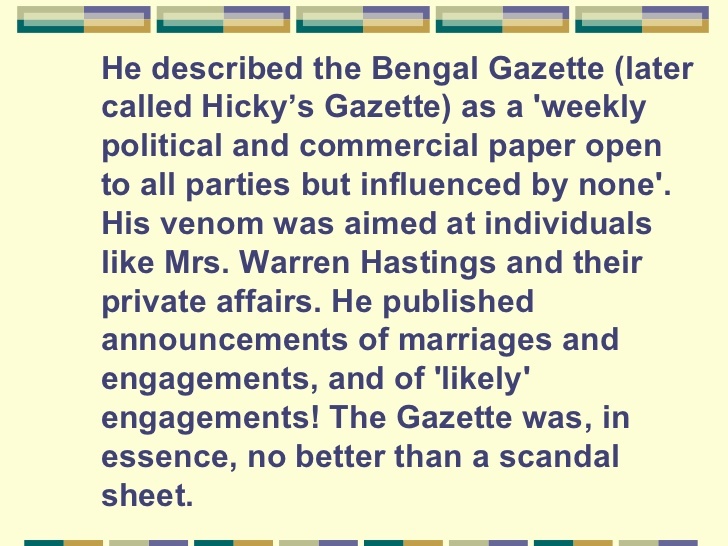 People anticipated that Hicky would publish just daily interesting social, political events and others happening in and around Calcutta in his news paper. When the newspaper kept churning out sensational scoops covering the rich, ruling class and the government, the surprised readers began to pay due attention to them. The paper was a trail blazer covering altogether subjects different from normal events. It became popular for its reporting on corruption and scandal among the British ruling class. This kind of sensationalism was a sort of publicity bonanza for the newspaper and for its subscribers it was a fine subject of gossip to spend their spare time. Because newspapers commonly gave weight-age to a variety of events, no newspaper was established then to exclusively cover corruption, financial irregularities, etc. which were rampant in those days and they went either unnoticed or failed to get serious scrutiny. Gov. Gen. Warren Hastings was at the helm and the newspaper was highly critical of his policies and the way he was running the administration. Credit goes to this cranky man who knowingly or unknowingly introduced provocative, but investigative journalism centuries ago in India paving the path for people's rights for free expression in India. In the last decades or so our investigative journalists write reports on our Netas (at Center and state levels) their corrupt governance, frequent junkets abroad, etc treading a different trail once blazed by Hicky in the early colonial era. Unfortunately this newspaper survived for too short a period - 2 years and the EIC seized the printing press and closed down the newspaper in March 1782. . Why did the government order its closer so soon? Because hie newspaper without any hesitation and censorship exposed the sinful deeds of the 18th century British elite that otherwise would have gone unexposed. The public was given a heady doze of the perversion of the so called aristocratic society. The newspaper had the guts to cover those topics (transgression of one's privacy) that were too taboo or disgusting to cover or speak publicly. the so called Gays and one Edward Tirettab got a good dig by Hicky's. There was a news item on a top Army Commander who had his own harem for relaxation and be from job pressure. The chief Justice of Calcutta Supreme Court at Ft. Williams Elijah Impey, a buddy of Hastings came under attack for taking bribes. Hicky never spared Church authorities running charity. He reported on the mishandling of funds meant for orphans by the Swedish Lutheran Missionary and Protestant Mission leader Johann Zacharias Kiernander. Hicky mentioned about an anonymous beautiful woman whose wedding broke the hearts of many of her suitors. Dejected and broken-hearted, to get over their pangs of separation, they found solace in a near-by brothel house.One aspect of Hick's reporting was that he never criticized these people for their perversions and aberrations. Hicky had a liberal views on human sexuality and in this respect he was ahead of his time. But, on the other hand. his opinions on women’s role in society was quite conservative and male chauvinistic. He expected them to be chaste and be faithful to their husbands. He implied that God created woman for man's pleasure. Yet another funny feature noticeable in his weird writings is he gave amusing and hilarious nick-names to many of the British Bobs based on their appearance and character. Readers would positively get a good laugh at them. Hicky had to face four dramatic trials in June 1781 for his derogatory writings, the Supreme Court found Hicky guilty and sentenced him to jail. However, his newspaper kept exposing corruption in the English company. He made scathing attack on Warren Hastings and it became a fodder for his opponents and it angered him. Hicky was finally suppressed when Hastings instituted fresh law suits against him. 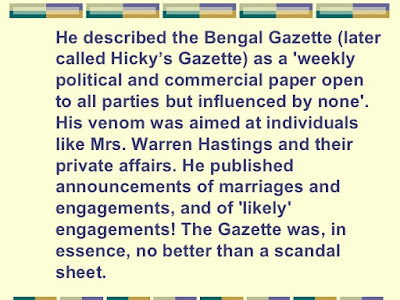 Hicky's Bengal Gazette ceased publication on 23 March 1782 when its types (printing press) were seized by an order of the Supreme Court. One amazing aspect of this newspaper was it was strongly anti-war, anti-colonial and highly critical of East India Company's under handed dealings by its leadership and for their expansionist and imperialist objectives. The newspaper inspired Indians to start a newspaper on their own. Thus this strange Irishman gave a space for investigative journalism in India that can get down to the evils in the society as well as in the government. With his newspaper, the age of journalism dawned in India in 1780.